Ogilvy Cape Town’s Silent Band commercial for the Volkswagen Golf 6 has won a Grand Prix and Gold Loerie Award award at The Loerie Awards, for live events, activations and sponsorship: live activations. A brass band was marched around the esplanade at Sea Point, Cape Town, with only the sounds of their feet on the ground heard by passersby. “Enjoy the Silence. The Quitest Cabin in its Class. The New Golf”. 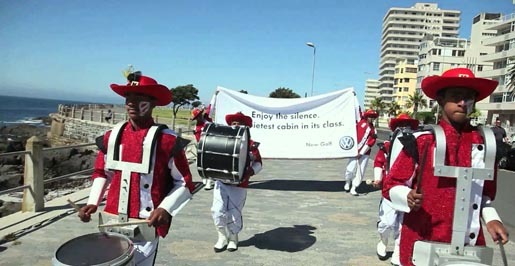 The Silent Band ad was developed at Ogilvy South Africa, Cape Town, by creative director Chris Gotz, art director Jamie Mietz, copywriter Peri van Papendorp, agency producers Iris Vinnicombe and Merle Bennet. Filming was shot by directors Peri and Jamie with director of photography Michael Cleary.